Six year old Jakapan starts school! Marvin has been learning all about recycling at school and he has been collecting lots of stuff. He has been saving all of our newspapers in a neat pile so that we can use them to cover the table when we are doing very messy jobs like painting and gluing. He has been collecting all of our old plastic and glass bottles, tin cans, old boxes from cereal and old shopping bags too. He makes sure that he washes anything that had food in it or otherwise it would be very smelly. He doesn’t keep potato peels or old food for recycling because these things will go bad and they can’t be used again. Midas well let me in. I’ve come to see you. Tock to me please, I’m lonely. Fido known you lived here, I’d have come to visit you sooner. Bungee jumping Barbie dolls make for tricky physics calculations! 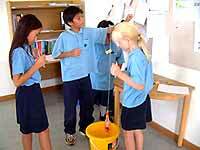 All of these activities were part of Prem’s first ever Science Day, which featured a series of fifteen different scientific projects run by teachers. The projects touched on each of four different subject areas: biology, chemistry, physics and technology. “The purpose of Science Day is not only to make science fun, but also to give students a hands-on experience working in a group. 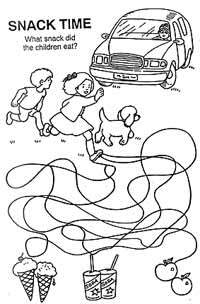 Many of these activities focus on problem solving. I think everyone is learning a lot,” explained Head of Science Dr. Alison Dangerfield. Senior school students Sonya and Alisa try not to spill! 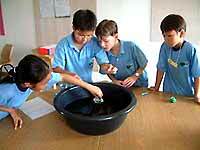 Students worked in teams of four, moving from room to room as they completed each task. Projects included microscope drawings, identification of substances using the five senses, building pH indicators, constructing bridges out of plastic straws and, unforgettably, physics calculations involving bungee jumping Barbie dolls. Prem students busy taking measurements. Don’t most children of that age in Thailand go to school? Not if they have a disability and certainly not if they have severe cerebral palsy like Jakapan. In most of these instances they are considered ‘uneducable’ and sometimes even thought to be ‘un-trainable’; hence they spend a large part of their life lying in a prone position on their backs looking into space. The children play with Jakapan, which challenges him mentally. This perception of children with cerebral palsy is probably largely due to their physical appearance which frequently gives the impression that they are unable to do anything. In many cases, they may be unable to walk or even sit independently; they may be unable to communicate through comprehensible speech but it does not mean that they are unable to think or to function cognitively. In fact, often it is quite the reverse depending on which parts of the brain have been damaged. So Jakapan, lucky boy, now has the opportunity to attend the Kindergarten Class at his local school, Baan Nong Chang Kheun in Amphur Muang District, Lamphun province. He will be accompanied by his mother for one hour on Tuesdays and Thursdays initially with a view to full inclusion at a later date as and when appropriate. All this has come about because Jakapan and his mother have had the benefit of a 10 week training course at Lamphun Special Education in collaboration with the Chiang Mai Disability and Mobility Centre once a week from July 23 to October 1. So, in a matter of 3 months, Jakapan has gone from being ‘stuck’ at home with little stimulation to being able to mix socially, play and learn with other children of his own age. Good luck Jakapan! - let’s hope your story and the willingness of Baan Nong Chang Kheun School to accept you into their Kindergarten Class opens the way for many more such opportunities for Thailand’s largely ignored and neglected children with disabilities, especially those “bright minds trapped in a damaged body” through no fault of their own or their families. Many Thai parents choose to send their children abroad to continue their studies. ‘Wan Nee Tee Muang Thai’ from Channel 11 decided to introduce Prem Tinsulanonda International School to Thai viewers as a viable alternative to private schools in other countries. The school is authorized by the Geneva based International Baccalaureate Organisation to deliver the International Baccalaureate (IB). Napaporn Nuchyu talking with Lister Hannah, president of the Prem Center. The television crew filmed their interviewer, Napaporn Nuchyu talking with Mr Lister Hannah, president of the Prem Center and head of Prem Tinsulanonda International School. They also filmed the school facilities, both academic and sporting, and many groups of students in the art house, the music rooms and in the pool. Four of the boarders even missed a few minutes of their computer and French classes in order to show the film crew their boarding apartments. The program aired on Channel 11 at the beginning of October. Kanoruk Pornsirichaivatana (15) just moved to Chiang Mai from Bangkok and will be attending Nakorn Payap International School, and she plans to some day study in America. Linda Heaney, president of Linden Education Services, made a brief but comprehensive presentation on the main facets of the U.S. education system and concentrated on areas that tend to be confusing to Thai students. She provided a lucid overview of how to choose a university and explained how to navigate the application process and provided insights about, the various degree options, the general education core curriculum, funding sources and visa issues. She also promoted the benefits of studying at American institutions over less expensive U.K. and Australian rivals. 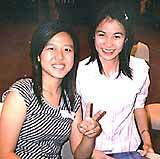 Sarinee Makurai, a 23-year-old graduate of Chiang Mai University, is interested in the MBA programs. Many Thais find the application process daunting especially the section where they are asked to write a personal statement about heir interests and reasons for studying in the U.S. Though universities differ on the importance they attach to this part of the application, Linda Heaney claimed that it’s the one area that Asian students fail to adequately promote their abilities and background. Teeraboot Supasa, (21) majoring in Industrial Engineering, is interested in using her strong quantitative skills in marketing and business studies in America and her friend Pattrama Piwong, a 21-year-old Industrial Engineering student at Chiang Mai University wants to join her. Though the cost of attending U.S. universities is nearly 50 percent higher than comparable institutions in Australia and New Zealand, there has recently been an upsurge among Thai students applying to American graduate programs, according to Linda Heaney. Especially popular among Thai applicants are MBA programs, master degree programs in engineering, and doctoral programs in the natural sciences, computer science, political science and economics. Few Thais or Asians choose fields in the humanities because of language barriers and lower demand in their countries of origin. There are almost 500,000 international students currently enrolled in American educational institutions according to data provided by Linden Education Services. This was only the second time in 11 years that Chiang Mai has hosted an American university fair. 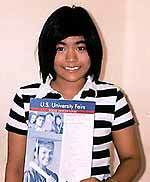 In 2002, about 60 students from Chiang Mai enrolled at American education institutions, compared with 600 from Bangkok. Planning for the future was on the mind of senior high school students from international schools on Wednesday October 8, when many attended the Linden Tours College Fair hosted by Chiang Mai International School (CMIS). The fair, which included representatives from 25 colleges and universities from across the United States, was part of a three-week tour of the region to promote tertiary education in the US. 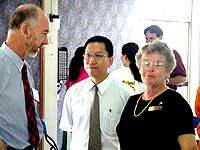 (L to R) CMIS Principal Russell Morton, Junji Taniguchi, site director of the Princeton Review in Chiang Mai, and Linda Heaney, president of Linden Educational Services, Washington DC. The tour was organized by Linda Heaney of Linden Educational Services based out of Washington, DC, in cooperation with Junji Taniguchi, site director of the Princeton Review in Chiang Mai and CMIS career counselor, Jon Hartmann. Chiang Mai International School was pleased to host Linden Tour’s first visit to Northern Thailand. A representative from Vincennes University discusses educational options with high school students. Texas State University - San Marcos, Farleigh Dickinson University, University of the Pacific, Pace University, Saint Louis University, Utah State University, Northeastern University, Florida Institute of Technology, Ithaca College, Embry-Riddle Aeronautical University, Portland State University, University of Bridgeport, University of Colorado at Denver, College for Creative Studies, North Dakota State University, Mount Ida College, State University of New York, Oswego, University of San Francisco, Rochester Institute of Technology, Emmanuel College, Binghamton University, State University of New York, Vincennes University, Oregon State University, University of Denver, and Virginia Commonwealth University. Linden Tours presented a University Fair at the Imperial Mae Ping Hotel on the evening of October 8, which was open to the general public. Parents and students had an opportunity to meet with US college and university representatives at Chiang Mai International School. An information expo held at Lotus Pang Suan Kaew Hotel, regarding Japanese Education, was set up by Rotary Thailand, Chiang Mai branch and Japanese language schools. Junji Taniguchi, the site director of the Princeton Review was the chairman for the opening ceremony. Junji Taniguchi, the site director of the Princeton Review with Takuo Hasegawa, the managing director and Panwipa Puapongsakorn, manager of Lighthouse Info Service, which organized the exhibition. 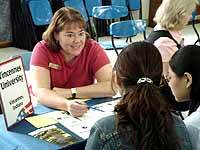 Many Japanese language schools set up information booths for people who were interested in studying in Japan. There were also scholarships for university students and post graduate levels, provided by the Thai Rotary (Chiang Mai branch), Central Thai Bank and the Japanese government. Junji added that it was very good that many people were interested in studying in Japan as it will foster good relationships between Japan and Thailand. Interested students read details about one of the schools in the exhibition.